Who doesn’t like a vacuum cleaner that has multiple uses? Most people have different surfaces to clean and different ways that they need to use a vacuum, so that’s why we are seeing more vacuum cleaners being manufactured with a variety of uses. 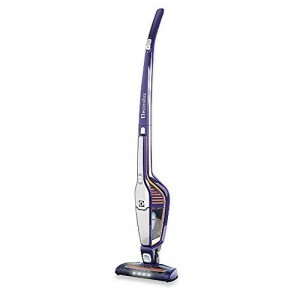 The Electrolux EL2030A Ergorapido Power Stick Vacuum, Purple is no exception. With just a flip of a switch, you can transform this vacuum from an upright stick vacuum to a handheld vacuum. Stick vacuums can’t always reach the darkest corners of a room or under furniture, so it’s nice to be able to detach the head and not have to get out a completely different vacuum. Convenience and ease of use make this vacuum a popular option for homeowners. People generally like how easy it is to use this vacuum. It has a 180-degree rotatable head, which makes it easy to maneuver around furniture and other objects. It also features a set of LED lights on the head, so that you can see under furniture if you need to. If you need to take a break for any reason, then the vacuum can easily lock into place and stand up on its own until you start using it again. Have you ever vacuumed up hair and then spent a lot of time untangling the hair from the vacuum? 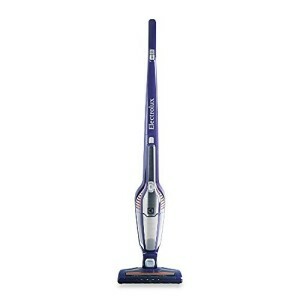 Well you won’t have to worry about that with the Electrolux EL2030A Ergorapido Power Stick Vacuum, Purple. Its Brush Roll Clean Technology will untangle the hair for you with just a push of a button. You just cleaned your floors, so you shouldn’t have to spend even more time cleaning your vacuum! Despite its convenient functionality, some people have reported issues with the battery life and other functions of this vacuum. The battery lasts at least about 20-30 minutes on a full charge, but over a period of time, it begins to weaken until it won’t charge. If you’re expecting to keep this vacuum for several years, you may be disappointed. Some malfunctions have also been reported with the Brush Roll Clean Technology, which won’t turn off after you push the button. This runs down the battery even more, which will decrease the long-term battery life. When this vacuum cleaner works properly, it can give you just about everything you would need to clean your hardwood floors and some carpeted areas. It is lightweight, so you won’t have to worry about straining yourself when you vacuum. Being cordless has its advantages, since you won’t have to find a new plug when you go into different rooms. Finally, the Brush Roll Clean Technology is an innovative feature that makes your life a lot easier. You are going to pick up hair from your floor, and it always gets tangled in the vacuum cleaner. Being able to untangle it and not worry about that part makes it worth giving the Electrolux Ergorapido vacuum a try. Electrolux isn’t the most popular brand of vacuum cleaner worldwide, but the company has a great history, and was founded in 1919 in Stockholm, Sweden. They specialize in manufacturing major and small appliances that can be used for commercial or residential use. On a larger scale, they are the second-largest manufacturer of general appliances worldwide. In addition to vacuum cleaners, Electrolux also makes appliances like refrigerators, dishwashers, washing machines and other household appliances. You may not have heard of Electrolux specifically, but they also make items under different names that you likely have heard of, or even own in your home now.